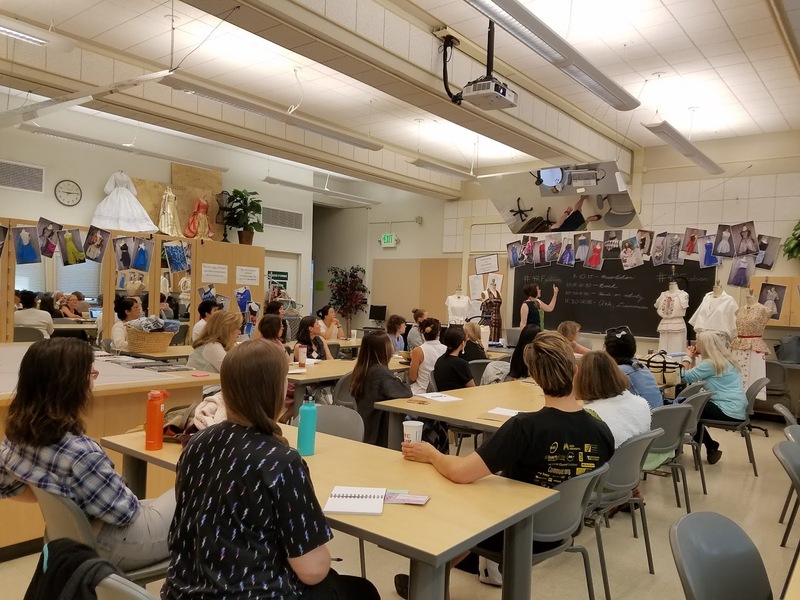 On Saturday June 30, nearly 40 people gathered in the fashion department classroom to take part in the 4R Fashion Workshop. In attendance were textile artists, professionals from the fashion industry, and sustainability specialists. Several students interested in sustainable fashion also participated. The morning’s activities were broken into three parts: a presentation by Cañada College fashion student Shana McCracken, a hands-on activity, and a group discussion. Shana’s presentation covered the waste reduction principles known as the 4Rs: Reduce, Reuse, Recycle and Rot (compost), as they relate to textiles. 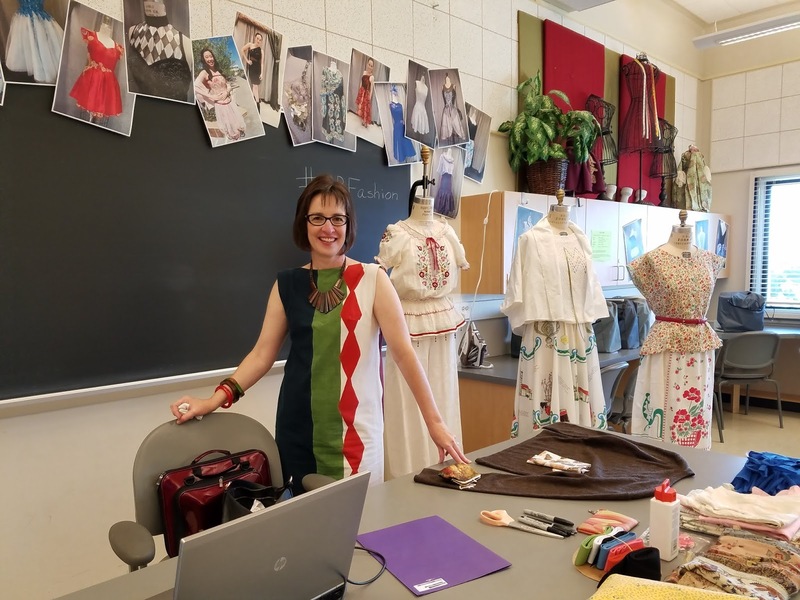 Shana talked about the reasons our society needs to stop throwing away clothing—among them, even natural fibers don’t biodegrade in a modern landfill. Better to donate or repair a garment rather than toss it in the trash. Participants worked with salvaged materials to create new designs or repaired garments they brought with them. Thrifted t-shirts were available for making reusable shopping totes—a fun project even for non-sewists. Featured speaker Angela Chou, founder of kids’ fashion brand Utterly, talked about how she uses screen printing to customize discarded fabrics from local clothing manufacturers. Tracey Harper, Integrated Waste Management Specialist for CalRecycle, provided a statewide perspective on the challenges of reducing textile waste. Among other alarming facts, Tracey shared that textiles from residential sources climbed 45% between 2008 and 2014. Though they only had an hour, these participants each completed a 4R Fashion project during the workshop: two reusable bags and a skirt made from a salvaged tablecloth. After the workshop, we asked participants to respond to an anonymous online survey. The responses were very positive, including 100% rating the workshop “Excellent” or “Very Good.” More than one respondent said the most valuable part of the workshop for them was meeting and networking with other like-minded people. One person commented, “I hope you continue to do more of these workshop[s] … ,” and several said they would like another opportunity to continue the conversation.